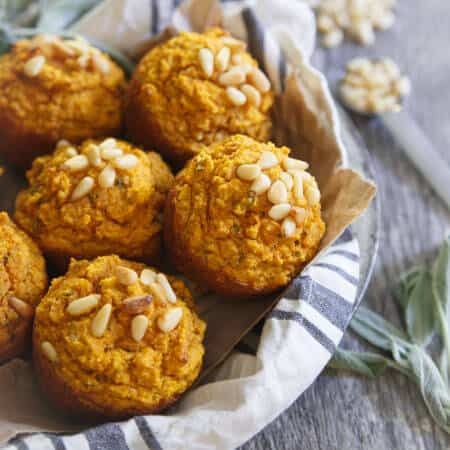 These paleo savory herb pumpkin muffins with toasted pine nuts are perfect for serving with your fall soup, stew or chili. Maybe even replace the Thanksgiving biscuits this year with a basket of these! 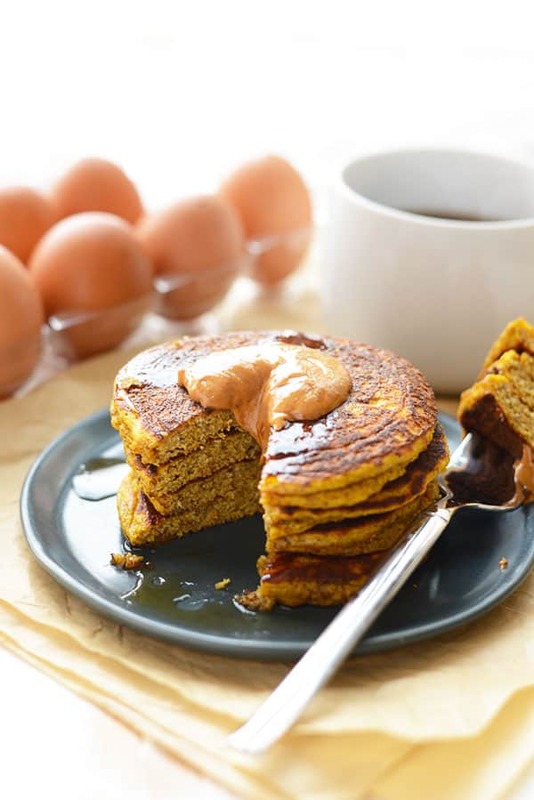 I feel like it’s kind of sad that we felt like we needed to get this healthy pumpkin recipe round-up out asap before pumpkin was a thing of the past. It’s October 14th! Pumpkin should just be getting started! But alas, it’s been out there since August and considering I’m about sick of all things orange at this point, I’m betting you’re getting there too. 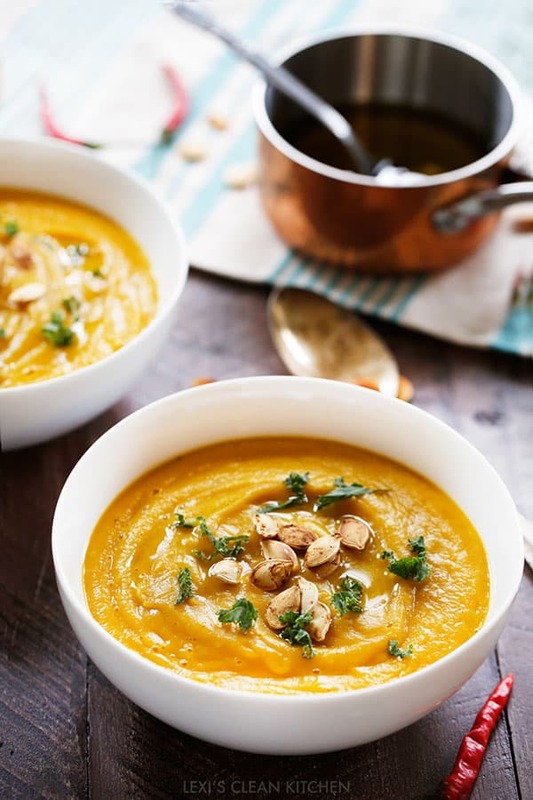 I’ve done a lot of pumpkin recipes on this site over the past 4+ years but I have to say, I much prefer it in savory things than sweet. Sweet things don’t actually taste like pumpkin, they taste like cinnamon, nutmeg, ginger and cloves but savory things, I feel like you can actually taste a bit of the pumpkin in them, not to mention it usually gives either a creamy, comforting or super moist effect on whatever it’s being used in. 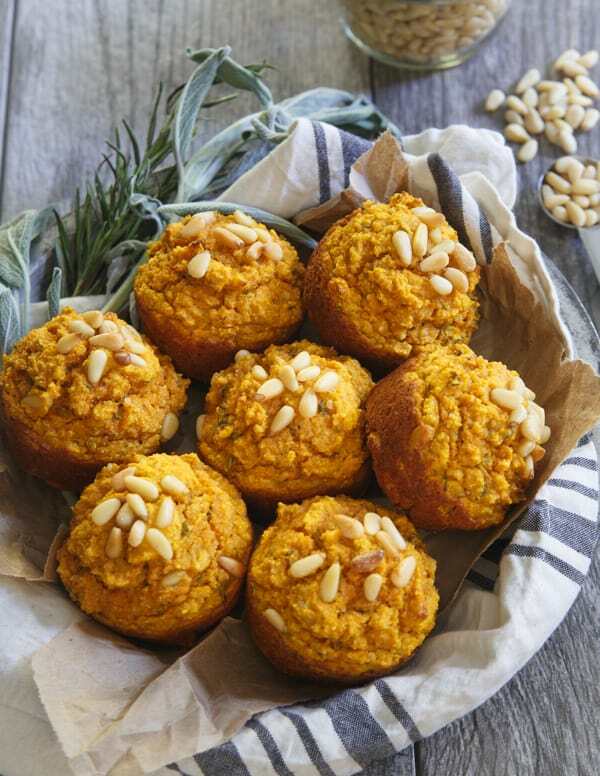 My contribution to the healthy pumpkin recipe roundup are these savory herb pumpkin muffins with toasted pine nuts. We’ll get to them in a bit, let’s take a look at everyone else’s recipes first! 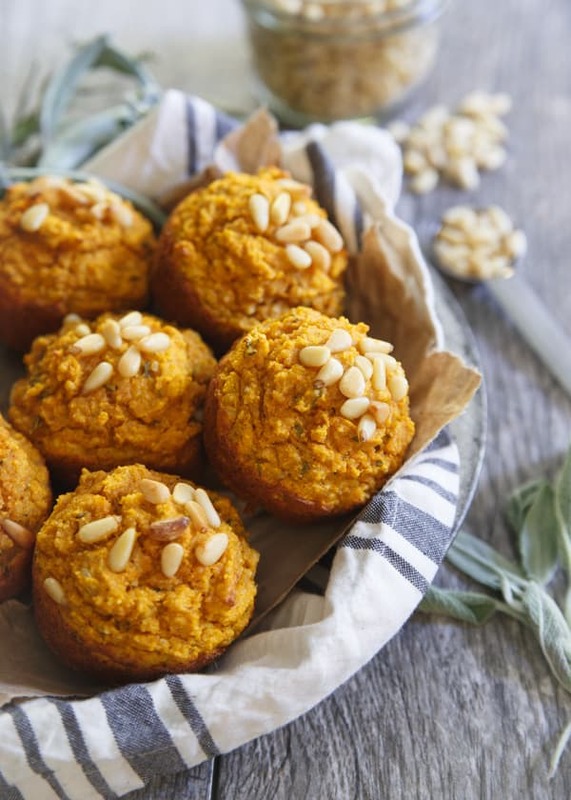 I was thinking of Thanksgiving when I made these savory herb pumpkin muffins. There’s always a basket of rolls or biscuits and in our family, no one is making from scratch biscuits (except for the one year I got majorly ambitious and tried these pumpkin popovers! ), we’d all much prefer to focus our efforts on more important things…like stuffing! So, inevitably it becomes a basket full of less than stellar store bought rolls. Honestly, they’re never even worth the carbs. These savory herb pumpkin muffins are prepped in just 15 minutes (and you could totally make them ahead of time). They’re full of fresh herb and pumpkin flavor with some toasted pine nuts for texture and they sure as heck beat out the lame dinner roll. Best yet? 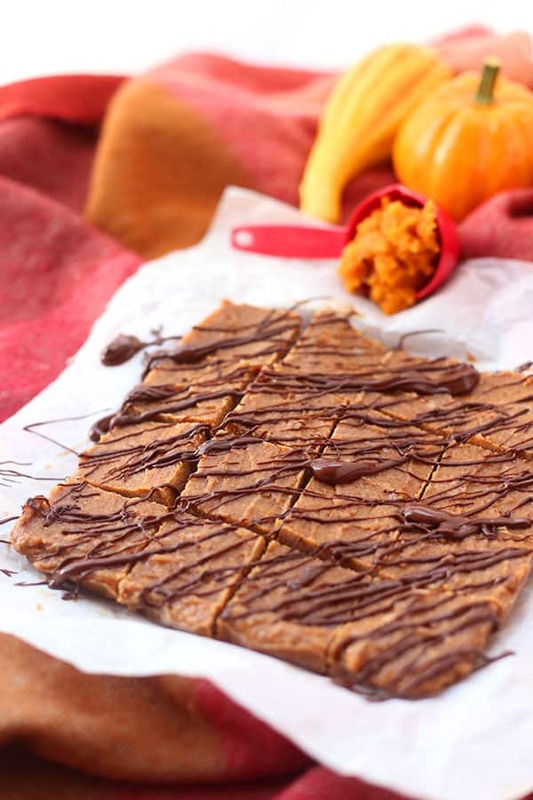 They’re paleo/grain free/gluten free so you can save your carb indulgences for other things on the table. Try these other savory/sweet muffins too! Preheat oven to 350 degrees. Grease a muffin tin with baking spray. Combine the flours, baking powder, salt, pepper and 2/3 of the toasted pine nuts in a large bowl. Whisk together the remaining ingredients in a medium bowl. Add the wet to the dry and mix until fully combined. Scoop the batter into the muffin tins and top with the remaining toasted pine nuts. Bake for 18-20 minutes until set. Remove from oven, let cool 3-5 minutes in the pan before running a knife around the muffins and popping them out onto a cooling rack. I could spend hours on this page checking out the links. Ok. Maybe not hours but I want to check out every recipe and make yours :) Yummy! 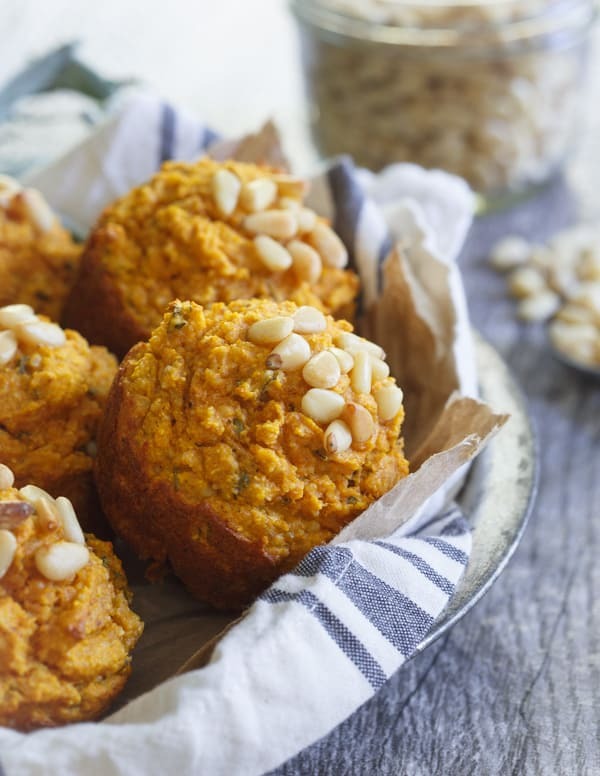 Definitely would have never thought to put pine nuts in a pumpkin muffin, but I love this savory combo! Pinning! These muffins are perfect for thanksgiving! I know my family would absolutely adore them! These are seriously so perfect for Thanksgiving. Cannot wait to switch it up with these! 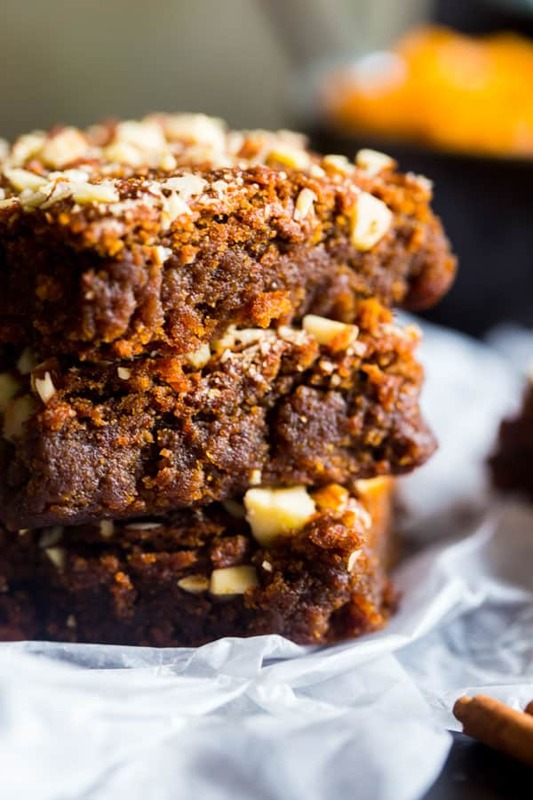 Ok all of these pumpkin dishes look delicious but man oh man these muffins! 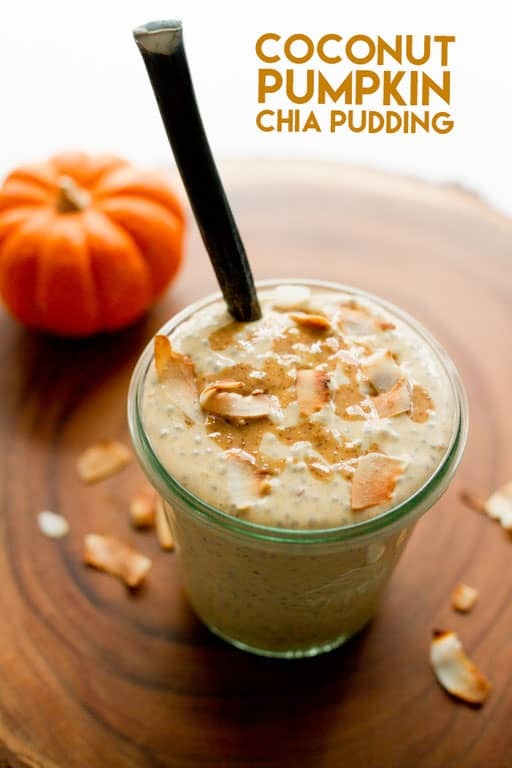 Love that nutty topping and all those herbs mixed in…yum! What can I use instead of cashew meal since I could not locate it at the store? Does corn meal work just fine? I am planning to bake them tomorrow. Almond flour would work too. Cornmeal should work but I haven’t tried it that way. Thank you so much! Will let you know how they turn out.